Article by Amy van Weelderen, who has the scoop on what to do in Vancouver to kick it old school. Leave the smart phones behind, as the nostalgic clicks of manual typewriters will send you back to another time and place. On the first Thursday of each month, Main Street’s own The Regional Assembly of Text, hosts a Letter Writing Club. This wistful monthly event is open to all, free of charge and nothing short of spectacular. The gracious hosts of The Regional Assembly of Text assemble tables down the center of their well-stocked paper and card store and bring out 20 or so timeworn typewriters for all to use. Rubber stamps, ink pads and lovely stationary with envelopes are all supplied and you are invited to sit and type as much as you would like. Tea and biscuits are provided and the atmosphere is one of small-town fun. The monthly letter writing club is held on the first Thursday of each month and goes from 7:00 – 9:30pm. If you add this to your list of what to do in Vancouver, be prepared to line up and wait, because it’s quite popular. When my husband and I began explaining the simplicity of a manual typewriter to our 10-year-old son it became clear that this was going to be a bit of a mechanics lesson. 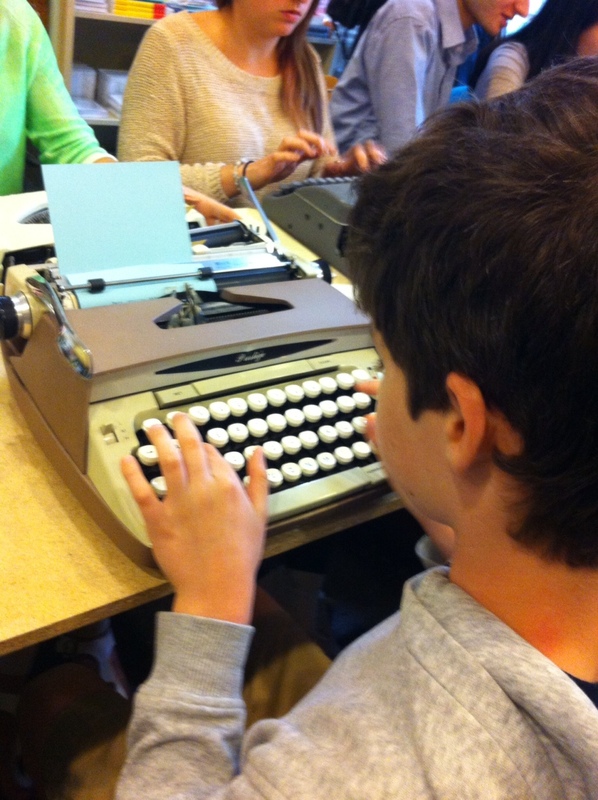 There is work to be done when using a typewriter and it involves more than just sitting down. You need to roll the paper in with a feed roller and line it up manually. There is no spell check, erase button or cut and paste on these timeworn machines. When the slight chime of the typewriter bell rings that means you need to manually swoosh the carriage return lever to get to the next line. All of this was strange and mesmerizing to a kid who doesn’t know a time before iPhones, X-boxes and laptops. Our son quickly got to work on a long and detailed letter. He had a hoot composing – click after click – a full page message to his grandpa. He was even more delighted when he got to let a newcomer in on how the typewriters work. Typos are abundant at The Letter Writing Club, but it does not matter. The finished product is a true declaration of devotion and the blunders are all part of the charm. The space is very small (no room for strollers) and I would recommend letter writers be nine years old and up. Whatever “type” of letter you want to write, make sure to add this event at The Regional Assembly of Text to your list of what to do in Vancouver for some good old fashioned letter writing fun. Amy van Weelderen always has something to say, either spoken or written. Having friends and family scattered across the globe, she is always on the lookout for unique and fun ways to correspond and still gets a thrill when she gets mail via poste. When not busy running Lullaby League, a babysitting referral company she owns in Vancouver, you will find her, pen in hand, jotting down ideas and planning adventures for her and her family.